Food excellent Italian and the blackboard menu with dish of the day may contain items prepared beforehand, Try and get something they have to prepare to order. Being a tiny place and if you dine on a chilly night be careful when the extractors in the kitchen are turned on as the seating area temperature takes a dive an the wind whistles around the legs. One might ask "Why Italian food in Greece?" Answer: After three weeks of excellent Greek food, the change to Italian sounded interesting, especially on this tiny Greek Isle. My wife and I were blown away by the quality of the food at this establishment. My wife ordered the boccatini with a red wine tomato sauce, I ordered a penne in a four cheeses sauce; we shared a Greek salad. The salad was served with warm bread. They allowed us to bring our own wine and did not charge a corkage fee. If you are in a hurry this is not the place for you: each dish is prepared fresh and is served steaming hot. Oh, and all this for 25 Euro! A half block walk from the marina; no outdoor dining. Everything in the menu was extraordinary, and the prices were very low considering how great everything was. It is a really cosy restaurant, and once you step into it, you instantly go to a magical world where everything feels and tastes like Italy. The pizzas where great and you should definatly try the shrimp rice which was extraordinary. 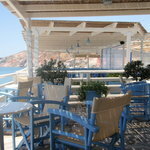 I went there with my husband, to eat 4 of the 6 days we went to milos. The other two i had food poisoning.. and i firmly believe it was because we ate somewhere else. It would be a pitty going to Milos..and not tasting El greco's delicius pizzas. Very quiet when we went. Far too much food and fairly bland. OK if you are happy to eat with all of owner's hangers-on sitting smoking at bar and him doing same outside. Surprised Italians have rated it highly. Been to El Greco? Share your experiences!